4" and 5" W/D Silicon Carbide sanding discs with hook & loop back. Can be used wet or dry. 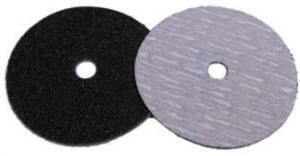 These discs have a 1/2" center hole for use with wet sanding stone tools. Hook & loop discs will significantly outlast PSA discs. Used mostly on granite, marble, stone, and other ceramic materials. Not recommended for metal sanding. Note that the 40 grit discs are a heavier weight dry only disc. See backup pads for these discs.